As the Space Launch System (SLS) teams head into their first full year since the vehicle was finally announced, fascinating – albeit well into the future – Exploration Systems Development (ESD) Design Reference Mission (DRM) options for deep space have been outlined in the SLS Concept Of Operations (Con Ops), options which include ambitious missions to the moons of Jupiter and Saturn. A solidified version of the roadmap for the Space Launch System (SLS) is expected this year, as much as there had been hoped the details would be forthcoming in the last few months. One of the main challenges is believed to be the long-term funding situation for NASA, which is – as always – under pressure. Such funding constraints on the Agency may even impact on the very configuration of the SLS, although seasoned NASA teams are understood to be providing a level of mitigation by working flexible options on the launch infrastructure. However, it was the ever changing refinements to the Constellation Program (CxP) vehicles – again via funding challenges – which eventually led to schedule milestone slips, the threat of extra costs as a result, all culminating in its cancellation after the findings of the Augustine Commission into Human Space Flight noted that while the vehicle hardware design was sound, billions of extra dollars were required to bring the program back into a viable schedule. The lack of a definitive roadmap – regardless of the reasons – is a problem, one which allows for the charge the vehicle should have been designed for the payloads, not the other way around. Such an issue is mitigated to a point by the size of the vehicle, with SLS’ massive capability – even prior to the evolved 130mt capacity – allowing for confidence in being able to achieve a large range of missions. With a solid plan to start with a 70mt capable Block 1 SLS, the Orion (MPCV – Multi-Purpose Crew vehicle) no longer has the mass constraints it complained about during its development to launch with the Ares I launch vehicle. 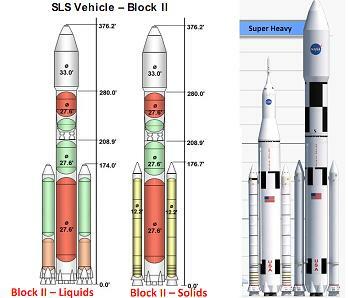 By the early 2020s, SLS will be upgraded into the Block 1A configuration, a 100mt vehicle which will utilize either solid or liquid boosters, prior to the eventual Block 2, 130mt vehicle, boosted by its triple J-2X Upper Stage. All three versions of the SLS will have a crew and/or cargo launch option, with the debut uncrewed launch around the Moon, set for 2017, to be followed by the first manned flight, which managers are continuing to push for a 2019 launch date – a two year improvement on the “worst case” manifest. This baseline knowledge had provided an initial “bible” of operations for the SLS – known as the info-heavy Concept Of Operations (Con Ops) presentation (available in L2), with its content being serialized by this site. Transporting humans further than the Moon has been an ambition of mankind for decades, but something yet to be achieved, not least due to the massive challenge of sustaining a crew on a deep space voyage for many months. Important lessons are being provided by the crews of the International Space Station (ISS), with average tours of six months showing humans can live and work safely “off planet” in micro G conditions. However, the ISS is an expertly controlled laboratory, racing around in Low Earth Orbit (LEO), with immediate means of evacuating crewmembers back to the planet if required. Sending humans into deep space, on a relatively small vehicle, will require advances in life support and additional mitigation against critical – mission ending – failures, to name but a few of the challenges. Preliminary work continues to mature on the ground, while teams plan out the potential missions NASA crews will undertake in what will be the next big drive for the Agency, the return to exploration. With a return to the Moon – at least its orbit, but potentially back to the surface – part of the opening salvo of mission goals for SLS and Orion, the ultimate aim is to send humans to Mars. Such a mission is highly unlikely to take place ahead of the 2030s, meaning NASA may even be beaten by one of the commercial companies – such as SpaceX. However, providing the tools of being able to successfully send crews as far as Mars will come via interim experience, gained from the initial SLS/Orion missions to the Moon and potentially a Near Earth Object (NEO), more commonly and specifically known as a Near Earth Asteroid (NEA) mission. 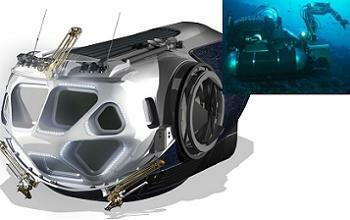 A large amount of training for such a mission has already taken place on Earth, not least via the NASA Extreme Environment Mission Operations (NEEMO) missions, which recently completed a six-EVA underwater simulation mimicking exploration of an asteroid – at least from the standpoint of being at the destination, as opposed to the challenge of the transit to and from the NEO. 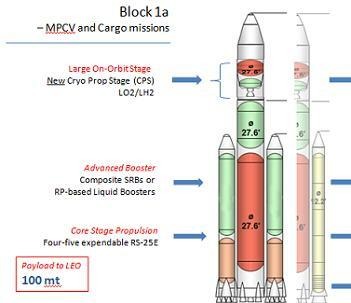 Cited as the Deep Space (Strategic and Architecture Timeframes) in the expansive Con Ops presentation, missions to NEOs may not require the full Block 2 capability of the SLS – if NASA managers opted to use the initial mission capability. The larger SLS would be required for an advanced mission profile. “The deep space missions are the longest duration missions in the DRM set. These include initial, advanced, and full capability missions to NEA (DRM IDs: NEA_MIN _1A1A/2A_C11B1 and NEA_FUL_1A_C11B1,” noted the Con Ops presentation. “The initial capability NEA mission, which is a Strategic timeframe DRM, will require two SLS launches with mass to orbit of approximately 85t and 90t. “The advanced capability NEA mission, which is an Architecture timeframe DRM, will require three SLS launches with mass to orbit of approximately 90t, 111t, and 111t. 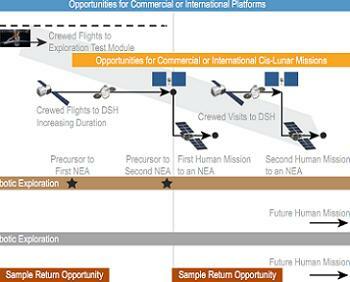 Destination options are not listed in the Con Ops, with the older Flexible Path presentation (available in L2) still the most comprehensive overview for the NEA and Mars mission options. The most likely candidates cited in the Flexible Path approach include a mission to Near Earth Object 1999AO10, requiring a launch date of January 2, 2026. NASA managers continue to note that a NEO mission would likely occur in the middle of the next decade, making this target a viable example. This deep space mission would last 155 days, around half of the mission length for the other candidate mentioned – 304 days – for NEO 2001 GP2. 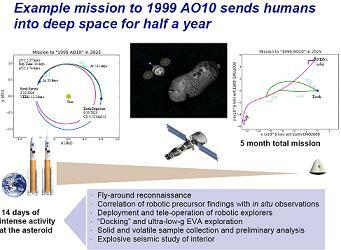 With a robotic precursor mission launched four years in advance, the 1999AO10 mission is portrayed as requiring two Space Launch System vehicles being readied to launch. The first HLV launch – per the Flexible Path approach – would place the Earth Departure Stage (EDS) and an “inflatable design Habitat” – otherwise known as the Deep Space Hab (DSH) into orbit first. The higher propellant load Orion/SM (Service Module) – and likely the MMSEV (Multi Mission Space Exploration Vehicle) – would then placed in LEO on the second launch. This is a different sequence to that proposed in other presentations, showing how such mission sequences remain undefined at this time. Further information became available via the Human Space Exploration Community’s Workshop, under the tagline “Mission Scenario: Asteroid Next”, which points to a potential requirement for crewed missions to an Exploration Test Module in the initial years of the 2020 decade. 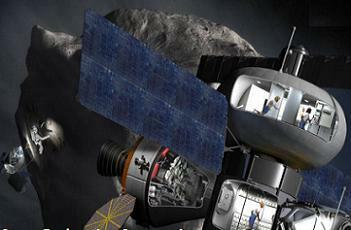 As referenced by the “Asteroid Next” presentation, these mission would be “In-space habitation for long durations in the appropriate radiation environment” to gain further knowledge and information on “radiation protection and measurement techniques; demonstration of beyond Low Earth Orbit re-entry speeds; subsystem high reliability and commonality (and) repair at the lowest level (while) living without a supply chain” – something which is extremely important for eventual multi-month/year missions away from Earth. 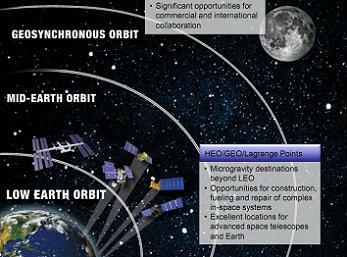 Under such a scenario, the Exploration Test Module would quickly be replaced by the Deep Space Habitat (DSH) to be launched by the SLS and delivered to the Earth-Moon 1 Lagrange point – which gives the added benefit of practising operations in a gravitationally null point in the Earth-Moon system. The next year would see a four-person crew staying for 90 days at the DSH before a 180-day mission the following year. By which time, a mission to an actual NEA would effectively be practised and proven from a crew survival standpoint. This also shows why Mars is so far away from being fully planned, as these precursor missions to the big prize learn mankind how to safely carry out crewed deep space missions, especially in such a risk advise era when compared to the Apollo era. 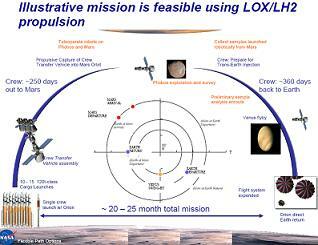 As outlined previously numerous times, the current favored approach is to aim for the moon of Phobos as a stepping stone to actually landing on Mars. This mission, while expansively covered in the Flexible Path approach, remains highly notional, given the lack of experience with the initial deep space missions. However, the Con Ops presentation then provides a surprise, by refocusing on SLS’ unmanned capability, in turn removing the caveat of having to learn how to keep a crew alive during long duration flight. NASA’s experience with deep space probes is well known and largely successful, but the Con Ops presentation points to a large advantage that can be gained by their monster rocket – providing “direct” missions to destinations in our solar system, removing the longer transit times that require gravity assists, in turn increasing the mission goals for the passenger payload/spacecraft. 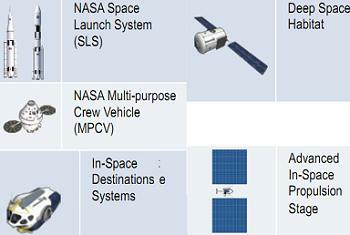 “The SLS is a feasible option to launch demanding missions to explore the solar system. The SLS capabilities provide three main advantages to Science Payloads: higher energy, larger diameters, and larger mass,” added the presentation. The claim is a fair one when comparing SLS to the currently favored Delta II and Atlas V launch vehicles for such missions involving deep space spacecraft, as SLS’ superior launch mass capability and larger fairing offer exciting possibilities for more ambitious hardware which may be too large for the medium launchers. “The SLS also provides 8.4 m and 10.0 m fairings to launch payloads with larger diameter apertures. This capability allows Earth observing, astronomical missions (e.g., planet finders), etc., with the ability to launch large single mirrors and lenses without the expense, complexity, and mass of segmented optics,” noted the Con Ops presentation. As if to drive the point home, the presentation provides examples of such mission capabilities, pointing towards missions to the exciting moons of Jupiter and Saturn, namely Europa and Enceladus. 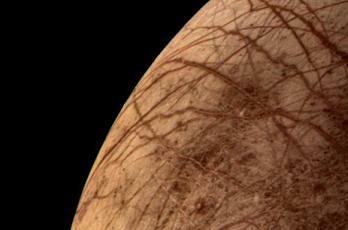 Europa, is the sixth closest moon of the planet Jupiter, and the smallest of its four Galilean satellites. A water ocean exists beneath its surface, which could conceivably serve as an abode for extraterrestrial life. Sister crafts Pioneer 10 and Pioneer 11 were the first to visit Jupiter, in 1973 and 1974, respectively. The two Voyager probes travelled through the Jovian system in 1979 providing more detailed images of Europa’s icy surface. Starting in 1995, Galileo began a Jupiter orbiting mission that lasted for eight years, until 2003. New Horizons imaged Europa in 2007, as it flew by the Jovian system while on its way to Pluto. The Jupiter Europa Orbiter, as part of the Europa Jupiter System Mission (EJSM) – a joint NASA/ESA proposal – is a potential future exploration of Jupiter’s moons targeting a launch in 2020, while Juno – launched by an Atlas V – is enroute. “The SLS could potentially enable sample return from Jupiter’s moon Europa, because it would have the payload capacity to provide shielding for a lander on the surface, and sufficient fuel for propulsive maneuvers out of the gravitational well of Jupiter,” noted the Con Ops presentation. 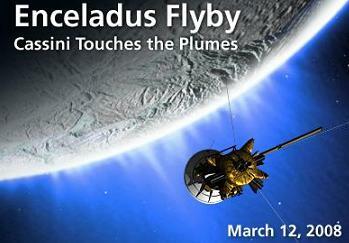 Enceladus is the sixth-largest of the moons of Saturn and one of only three outer solar system bodies (along with Jupiter’s moon Io and Neptune’s moon Triton) where active eruptions have been observed. No firm plans to return to the moon have been confirmed, with the Titan Saturn System Mission (TSSM) – a joint NASA/ESA proposal for exploration of Saturn’s moons, including Enceladus – currently behind the Jupiter EJSM in the mission order. Numerous articles on SLS/Orion and Exploration Roadmaps will be published over the coming weeks and months.